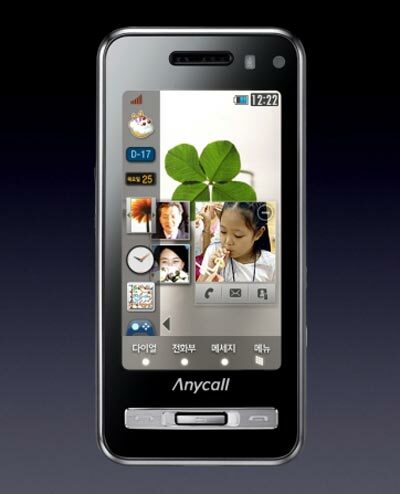 Check out this new cellphone, the Samsung Anycall Haptic. There will be two models available, the SCH-W420 and SPH-W4200, which will both come with a 3.23 inch touchscreen display, a 2 megapixel camera. stereo Bluetooth, a full Internet browser and DVB-T. They will also feature 22 kinds of vibration that are built in and apparently when you increase or decrease the volume on the radio an old school radio appears and the sound and feel of the click are simulated via the haptic feedback, check out this video of it in action. I have to say from the photos and video it looks pretty slick. The Samsung Anycall Haptic will go on sale in Korea for between $700 and $800 (depending on model), no word on availability for the rest of us as yet.